French painter Henri de Toulouse-Lautrec was born #onthisday in 1864. Along with his paintings, he was known for his prints, illustrations and caricatures which brought to life the vibrant and decadent affairs of France in the late 19th century. Toulouse-Lautrec was amongst the best known artists of the Post-Impressionist period, along with Cezanne, Van Gogh and Gauguin. La toilette (Celle qui se peigne), Henri de Toulouse-Lautrec, 1891. Oil on board. See it on display in the Pissarro Gallery (65) on the third floor. Lautrec devoted a majority of his time to painting both seedy and serene aspects of French nightlife, capturing moments of decadent exuberance as well as quiet solitude. Though his work makes up the bulk of the exhibit, that doesn't mean Lautrec was the quintessential chronicler of Parisian dance halls, nightclubs and brothels that made up the belle epoque period of French life in the late 19th century. "Lautrec captured what it felt like to be in the dance halls and nightclubs as opposed to what Montmarte looked like," says curator Douglas Druick. "You don't get a sense of the excitement of the era looking at a photograph, but you do when looking at his works." "What's fabulous about Lautrec is he observed and interpreted it, so we're seeing it through this particular person's eyes," adds Mary Weaver Chapin, a co-author of the catalog accompanying the exhibit, and a former Andrew W. Mellon curatorial fellow at the Art Institute. "He is not just a chronicler of the scene." Nor was he the only one on the scene. Though Lautrec is perhaps the most familiar artist to draw subject matter from both the highbrow and lowbrow places of entertainment in and around Montmartre, he was joined by the likes of Theophile-Alexandre Steinlen, Vincent van Gogh, Pablo Picasso and several other artists who flocked to the neighborhood north of the city center of Paris between 1885 and 1904. "All around the rest of Paris, sections of the city were being razed so the wide boulevards we've come to know could be put in," Chapin says. "Montmartre was untouched, and remained a low-rent district popular with anarchists, Communards, students and artists." And it was probably the last place you'd expect to find someone of Lautrec's class. Henri Marie-Raymond de Toulouse-Lautrec Monfa was born in 1864 in the south of France to an aristocratic family who owned much of the area. Growing up, he was always in fragile health, which some have attributed to inbreeding (his parents were first cousins, and many of Lautrec's own cousins suffered similar ailments). As a teen, Lautrec broke both of his legs within a two-year period. Neither leg ever knitted properly -- possibly due to a congenital defect -- and his legs stopped growing. The rest of his body continued to develop. He eventually reached 4 feet 11 inches in height. "He also had a lisp and spoke French with a strong southern accent," Chapin says. "He rarely made a great first impression." He buffered his rather awkward physical appearance by eccentric characteristics, but he wasn't the only eccentric in his family. "His father and his grandfathers were also pretty out there," Chapin says. "This was a time when the rich could get away with anything." His family had no problems accepting outlandish behavior. His choice of career was another matter. An 18-year-old Lautrec arrived in Paris in 1882 to pursue his art studies. Like many students, he was hardly all work and no play. And he seemed to enjoy either provoking his family or at least flaunting his bohemian lifestyle to his family back home. "There's one extra-charming letter in particular where he writes, 'Dear Mom, I've been hanging out in this club with these anarchists,'" Chapin says, chuckling. Still, there was one thing worse than hanging out in cafes and bars with malcontents, and that was simply the fact that Lautrec was hellbent on making a living as an artist. "He was from a family of aristocrats," Chapin explains. "Working for a living was viewed as something below his class." His family even asked him to paint under a pseudonym and, for a time, he did. He used a variety of names, most notably "Treclau" -- an anagram for Lautrec. Hanging out in places like Le Chat Noir (The Black Cat) and the Moulin Rouge proved proved to be a good thing for Lautrec, because it was those places that helped skyrocket him to fame. Lautrec's first foray into lithography -- an art form in which he would demonstrate a talent for innovation -- occurred in December 1891. Though he had spent nine years in Paris, he literally became an overnight sensation when 3,000 copies of his publicity poster "Moulin Rouge: La Goulue" were plastered all over Paris. "You can't really imagine the kind of notoriety he gained," Chapin says. "Three thousand posters going up in one night was mass communication." And Parisians weren't just looking at his posters. They were carefully tearing them down and taking them home. While he wasn't the first person to legitimize the poster medium (Jules Cheret is given that credit), Lautrec was the first avant-garde artist to try his hand at poster-making. "He took a very modern approach to the medium," Chapin says. "This was cutting-edge art applied to lowbrow entertainment." He found success in the medium in part because he had an uncanny ability to boil down a performer's essence to a few iconic characteristics. In cancan dancer Louise "La Goulue" Weber's case, her squinty eyes, penchant for high kicks and her whirling petticoat tell you all you need to know about her nightly performances. For the cabaret singer Yvette Guilbert, her character was reduced to thin woman with black gloves and a nose like a beak. Singer-songwriter Aristide Bruant's image was distilled to a wide-brimmed hat, black cloak, red scarf and walking stick. "Lautrec was also very savvy," Chapin says. "The reason these posters survive is because Lautrec would save very good proofs to sell to collectors or through vendors. He would hang and sell them right next to his oil paintings so you would have art right next to something that was mass-produced. He was the first artist to paint the celebrity as we understand the notion today." And in the process, he managed to create his own celebrity. "His life reads like a movie script," Chapin says. "His parents were cousins, he was born with a deformity and he gained artistic acclaim before dying at an early age. Beyond that, there is also his art that resonates with his own fascination with celebrity and nightlife. In short, it's great material to work with." As you may know, absinthe -- one of the liquors popular to many bohemians like Lautrec as well as writers, singers and 19th-century Parisians -- has been banned in the United States since 1915 thanks to the hallucinogenic qualities of one of the chief botanical ingredients: wormwood. Wormwood contains a chemical called thujone, thought to be psychoactive. Those seeking to dance with "The Green Fairy" (so named because when absinthe is mixed with water, the resulting mixture turns an opaque green) needn't break the law to quench their thirst. Absente (or, as the French call it "petite absinthe") is legal and available for purchase in the States (Binny's Beverage Depot has a 750-milliliter bottle for $39.99). Absente is made from a less-bitter cousin herb called southern wormwood. The level of thujone in southern wormwood is at Food and Drug Administration-permitted levels, making Absente perfectly legal. That doesn't mean the drink is any less potent, says Jim Nikola of Crillon Importers, the U.S. distributor of Absente. "This is as close to illegal absinthe as you can get without it being illegal," Nikola says. "It's still pretty strong." The traditional method of serving the drink requires placing a sugar cube on a specially shaped, slotted absinthe spoon. You balance the spoon on a glass filled with 2 ounces of Absente and pour 3.5 ounces of cold water over the sugar cube, then stir with the absinthe spoon. Of course, if you're leery of investing in a full bottle, Nikola says you can always try Absente at the Absinthe Cafe (1958 W. North), Delilah's (2771 N. Lincoln) and the Ritz-Carlton (160 E. Pearson). Lautrec wasn't just a big fan of this traditional drink, though. "He had a strong predilection for all alcohol," says exhibit curator Mary Weaver Chapin. "He was also fiercely fond of American-style cocktails." One of the recipes Chapin came across in her research was for an absinthe cocktail he created called "The Earthquake." Mix equal parts of Absente with cognac and pour over lots of ice. "'Earthquake' was a perfect name for it," Nikola says. "The drink is so strong, it may certainly create tremors through your body." Cabaret as an art form is alive and well in Chicago. While there are notable differences between French and American-style cabaret, you'll still feel like Lautrec sitting at a cocktail table at Davenport's (1383 N. Milwaukee), or Gentry (440 N. State and 3320 N. Halsted) -- especially if you bring your sketch pad and charcoals. The larger-than-life artist was the main character in John Huston's 1952 film "Moulin Rouge." Jose Ferrer received an Oscar nomination for his portrayal of the artist. Zsa Zsa Gabor starred opposite him as French performer (and frequent Lautrec model) Jane Avril. Lautrec also turned up briefly in Vincente Minnelli's 1956 Vincent van Gogh bio-pic, "Lust For Life"; (Jerry Bergan played Lautrec). More recently, John Leguizamo played the artist in Baz Luhrmann's 2001 romantic musical, "Moulin Rouge!" that set modern pop tunes in the belle epoque era. Lautrec's art has been a frequent source of inspiration for animators and costume designers. For Gene Kelly's classic 1951 film "An American in Paris," costume designer Irene Sharaff created costumes for each of the film's ballet sequences around artists like Manet, van Gogh and Lautrec, winning an Oscar for best costumes for her efforts. Legendary animator Chuck Jones drew inspiration from van Gogh, Monet and Lautrec for backgrounds in the 1962 animated film "Gay Purr-ee," which starred the voice of Judy Garland and featured music by Yip Harburg and Harold Arlen. There's even a science fiction connection. Lautrec's poster of Aristide Bruant (see image on previous page) with long scarf and wide-brimmed hat, was the inspiration for the costume worn by Tom Baker as the BBC's fourth "Doctor Who." Henri de Toulouse-Lautrec was born #onthisday in 1864. The French painter and printmaker is famous for his depictions of the glamour and excess of Paris in the late 19th century. https://www.nga.gov/Collection/art-object-page.52228.html d'Anselme and Tapié de Céléyran are according to labels on back of painting. The latter was a cousin of the artist, whose mother was Adèle Tapié de Céléyran. Exhibited with Molyneux collection in 1952. Another take on ‪#‎Youth‬ is considering the artist’s age when creating a work of art. We often don’t consider the stage of an artist’s life when he or she worked on a picture. 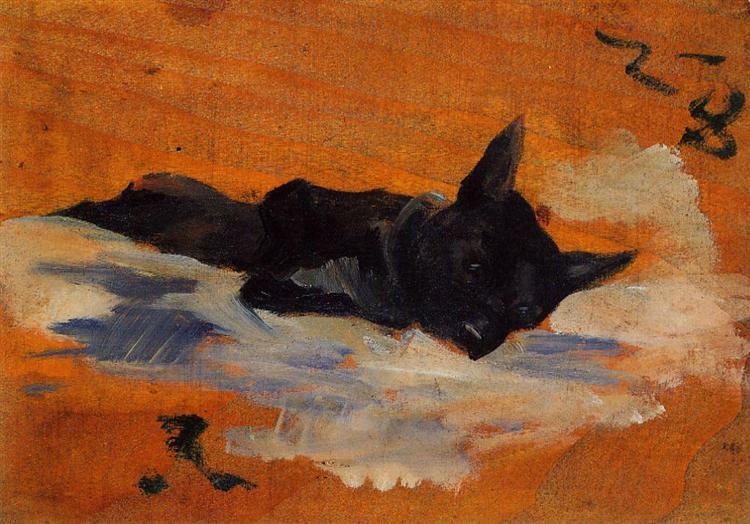 Let your eyes wander over this painting, “The Artist’s Dog Flèche” by Henri de Toulouse-Lautrec. What do you notice first in this work of art? This Brutal World. Brutalism is having a moment. 蘇東坡：Wood and Rock (11th century), Su Shi. "World War I and the Visual Arts,"